I'm thankful that, on the worst driving day of the year, I made it from West Philadelphia to Silver Spring in two hours and fifteen minutes. I'm thankful for my family, my friends and my boyfriend, my ongoing education, and the tofurkey I am going to eat today. And I'm also regretfully thankful for Chris Jones, developer of the new Burtonsville Town Square shopping center and home to the new Burtonsville Giant, located across the street from the old one. You see, I forgot to bring deodorant with me from Philadelphia, and I found myself standing in the doorway of the new supermarket wonderland that just opened in Chris Jones' shopping center. So big. So yellow. So much stuff. (A whole aisle of bulk candy and nuts!) And, on the night before Thanksgiving, surprisingly empty. Perhaps that's because there's so much room. 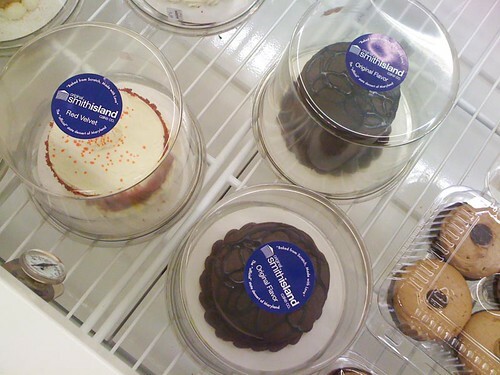 As always, the way to my heart is through my stomach, and I must admit I fell in love with Chris Jones when I discovered this case of yummy Smith Island cakes inside Giant. For those who don't know, the Smith Island Cake is Maryland's official state dessert, made from eight to fifteen layers of cake with icing between. These cakes come from the Original Smith Island Cake Company - not to be confused with the Smith Island Baking Company, founded by former Republican gubernatorial candidate Brian Murphy. 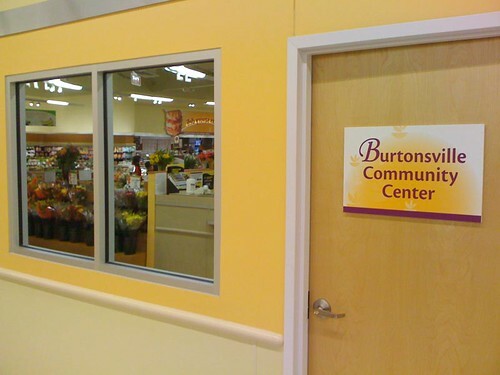 Lastly, there's this space in the store, called the Burtonsville Community Center. It's no town square, though. The one-way windows are kind of creepy - shouldn't a community space be more open than that? I joked to my friend who I was shopping with that this will be where the Burtonsville Mafia meets to make deals in secret. The supermarkets I can shop at in West Philadelphia tend to be small, pricey and over-stocked, so I've become more appreciative of the fancy suburban grocers I grew up with. 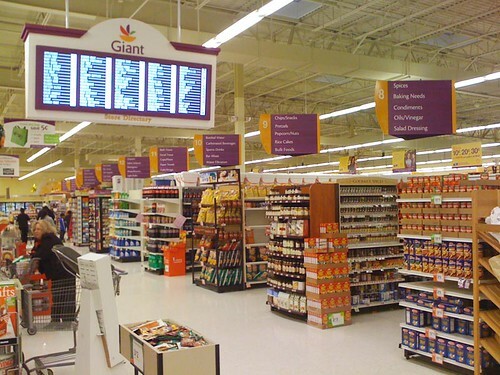 I'd come back to the Giant at Burtonsville Town Square - but, on the other hand, they still don't have a beer and wine aisle like the one in White Oak, which is a major factor in my grocery-buying decisions. I'm still not keen on Chris Jones, and I would've rather he never brought his take on "progress" to Burtonsville, but I have to admit I'm slowly, very slowly, warming up to it..
We ended up at the 'new' Giant as well. We'd eaten just last week at Cheeburger Cheeburger and our girls noticed that the 'old' Giant was closed. I had no idea they'd developed any affinity for that location ('our' Giant is in Colesville) but when on a whim I drove past the 'new' Giant, they were both balling, with much lamenting that this was the Giant that 'crushed their hearts' and that's a verbatim quote. SO when we pulled up there this past Wednesday for some last minute things, they were at first hesitant to patronize the place, which lasted about ten seconds after walking into the new store. I'd agree that the new store has much to offer. But, I found the doors small. This is a minor point. But consider the carts are bigger and they are imploring you to shop more and more, smaller doors seemed odd. I also thought it was a really long walk from our check-out cashier to the door itself - passing that 'community center'. Any word on how long that 'center' space will last in its current fashion? It was a good experience overall and I am sure when we're returning to Silver Spring from Columbia that we'll shop there more often. I'm eager to see what else moves into those empty storefronts, too. I do enjoy the new giant, but I hope they do something with the parking lot. Anyone else have problems with people not knowing who to yield to??? Looks like to me some stop signs are needed somewhere. It didn't help that my first visit to the shiny new Burtonsville Giant coincided with both the after-work swarms and the first few days of wearing my new progressive-lens glasses. I couldn't tell if I was confused by the crowds, the shiny displays, or the trifocals. What really confused me were the new baskets! I was pleased to see that this Giant has acquired those short 2-level carts, which I got hooked on at the Safeway in Georgetown. Most grocery carts handle like an SUV, but these little ones are like Mini Coopers. However, I'm not quite so pleased by the new large wheeled hand baskets. They're too big to carry comfortably (when you're 4'10", anyway), and it's a bit tricky to pull them behind you in a crowded store. I've taken to pushing them for added control. It's a bit annoying to have to either bend down to place items in the basket or to have to judge an item's fragility before just dropping it in. I like the bulk food aisle and the expanded selection, and having self-checkout with both conveyor and kiosk options. The kiosk style that verifies your purchases by weight is a pain if you bring your own bags; the Harris Teeter in Maple Lawn has "Your Bag" button on the touchscreen to get around that, but I didn't see that option at Giant. We know what's coming to some of the empty storefronts - a county liquor store next to the Giant, a Dunkin/Baskin Robbins combo in the adjacent strip (I wonder if it's the same franchisee who operated the Burtonsville Shopping Center store), and the Hair Cuttery (don't know when it's moving, though). Pet Barn is surveying its customers for preference - stay put, move to the new center, or move up the road to Maple Lawn. I wonder if the KFC/Taco Bell franchisee who suddenly closed up shop at the old center is relocating to the new one? I don't think there's a pad site there for a fast food outlet, though. I believe the reasonwhy the Giant does not carry beer is due to the liquor laws of Montgomery County. It was explained to me that only one store in a chain may carry beer and wine. Thus the White Oak Giant was the store selected many years ago.